Mohau Modisakeng, recently selected for the South African Pavilion at the 2017 Venice Biennale along with Candice Breitz, has a video and six large scale photographs in his first solo exhibition in the United States at Laumeier Sculpture Park in St. Louis. While all self-portraits, the works are multilayered, with different aspects that shift into and out of the foreground like ambiguous positive and negative space. The photographs are loaded with pathos coupled with highly specific symbolism that makes a straightforward reading of them quite difficult, so I will work around them from three directions—the work as dream or vision, the work as politics, the work as self-portrait—in an attempt to build a sense of what is going on in the photographs and video as these interpenetrating layers dance together. Work by Mohau Modisakeng, courtesy of the artist, 2017. 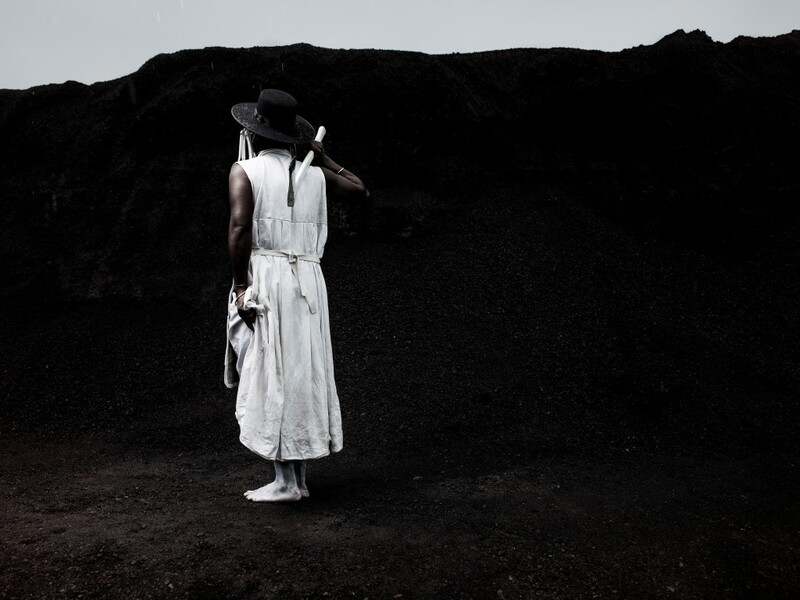 The dream-like quality of the video, To Move Mountains, and the Endabeni photographs grows out of the stark landscape and eclectic costume: The artist stands in a black landscape of giant heaps of asphalt. He wears a white dress with a white leather apron, a white dust mask, white horse blinkers, and a black trilby hat. His feet are painted white. He holds a machete and a white axe. Alternately, in the two Ga Eshto photographs, the artist appears as a black shadow against a white background, wearing only the overalls, blinkers and the trilby hat (which becomes a kind of halo), brandishing a machete in one and blowing smoke the other. I read this as a dream or a vision because I get the sense that some revelation depends upon deciphering the elements and unlocking the image. My thoughts jump less to Freud here than to visionary literature (as disparate as Julian of Norwich or Black Elk), where each element of the dream or vision latches on to some key element of reality outside the dreamer and, when understood, discloses a message that the world vitally needs to hear. The dream or vision (as opposed to an expressive self-portrait) reaches outside of the individual consciousness of the dreamer, revealing something not about the individual’s psyche but about the world at large. Every detail signifies. The range of signification in the details is broad: the trilby hat (colonialism, urban society, upward mobility of migrant labor), horse blinkers (nonhuman animal labor, enforced blindness or tunnel vision), the white, leather workshop apron (manual labor), the white dust mask (workplace health hazards, disability, dust), the white ankle-length dress or tunic (gender? ), white painted feet (ritual? ), the axe, painted mostly white, and the machete (agricultural labor, conflict). I struggle to pinpoint the revelation here but that is also an important element of the dream or vision: the image burns itself into the mind, and interpretation takes place over a lifetime. The most straightforward reading of the symbolism is political: the clothing and landscape directly allude to colonialism, the legacy of racism in post-apartheid South Africa, and questions of labor and gender. The horse-blinkers are especially suggestive here: we see the artist wearing the bridle of a working animal—evoking the dehumanization of forced manual labor and the reduction of the human body to horsepower. Blinkers blind a horse to the distractions of working in the city, keeping the animal on task, moving forward. It is not a stretch to see the same kinds of manipulation at work in social institutions that reinforce the boundaries of a perpetual working underclass, especially one defined by skin color. But Modisakeng’s work does not seem an explicit call to political action: if the artist sometimes strikes a confrontational pose (as in the two Ga Etsho photographs), the overall effect of To Move Mountains, especially, is not of engaged struggle. Quite the opposite: the artist wanders in the desolate landscape alone. The only thing here is asphalt, piles of raw material for an unquenchable building machine. The artist feels lost here—lost in a sea of abstractions, perhaps, or marooned in a desolate place—cut off from other people. Sometimes striking aggressive poses, but sometimes, also, scrambling up a crumbling hill, awkwardly and without grace. The poses and movements often feel unsure of themselves, and the figure wandering in the landscape is a lot more vulnerable than in the more heroically posed still photographs. It is striking that despite the fact that the works are all self-portraits, we ultimately see very little of the artist. In the Endabeni series and To Move Mountains, the blinkers, dust mask and hat almost entirely conceal his face. What little skin is visible is a striking moment of warmth against the cold black and white of his clothing and the asphalt hills behind him. 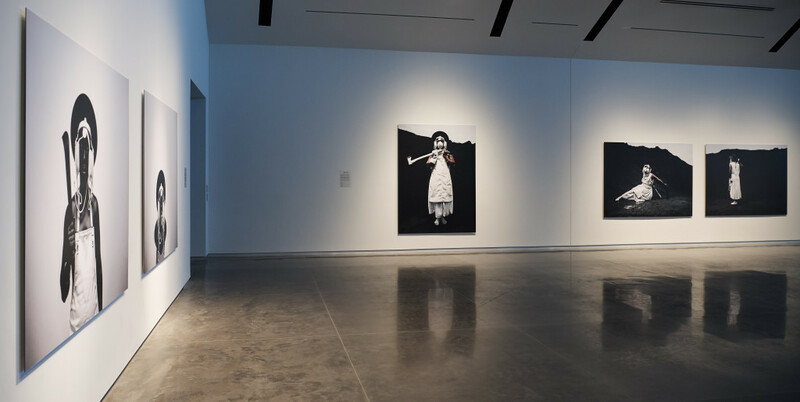 In the Ga Etsho photographs, the artist’s body is flattened into a silhouette against the stark, white background, his face reduced to a few ghostly highlights floating in the hat-halo. There’s a way that the symbolism overdetermines the image—there are so many political-historical implications in the image that it’s difficult to pick out the person in the images as a subjectivity operating within the larger social forces. As self-portraits, then, I am left with the sense of a self obscured, not a self revealed. The implications of this reading lean toward tragedy, as the personhood of the artist is eclipsed by the historical/political/social baggage that the artist wears as armor/costume/regalia. The presence of the artist is affirmed through concealment—a kind of via negativa to the self. Each of these three potential readings—the work as dream or vision, potent but mysterious; the work as political vision without apparent call to action; and the work as self-portrait of an obscured self—is in tension with the others, and each layer simultaneously invites and resists other layers of meaning and interpretation to create a deeply ambiguous image. That these layers resist resolution is at once unsettling and charged and does not detract from but contributes to the work’s power. Mohau Modisakeng at the Adam Aronson Fine Art Center at Laumeier Sculpture Park runs through January 29, 2017. January 2, 2017 | Filed under Art Seen: National and tagged with Adam Aronson Fine Art Center, Brian Prugh, Laumeier Sculpture Park, Mohau Modisakeng, The Seen.